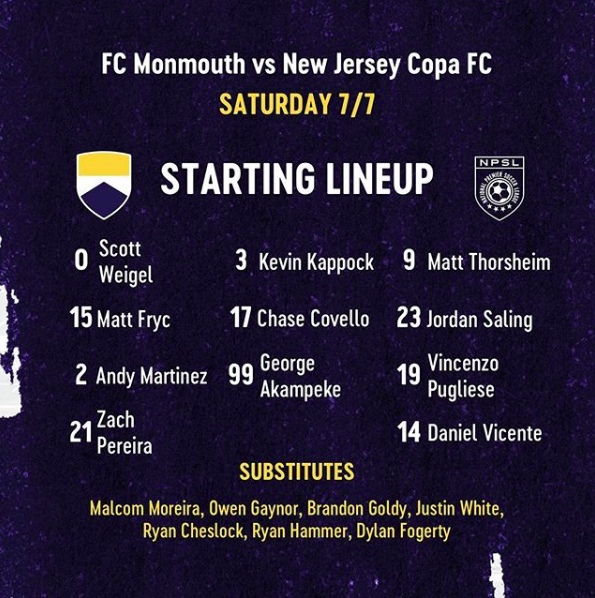 WEST WINDSOR TOWNSHIP, NJ – FC Monmouth defeated New Jersey Copa FC at Mercer County Community College on Saturday night, leaping over their local rivals in the Keystone Conference table to finish the regular season in fourth place and earn the last playoff spot. The first big chance of the match for either side came in the sixteenth minute, when FC Monmouth forward Jordan Saling smashed the crossbar with a mis-hit shot from point-blank range. Two minutes later, FC Monmouth took the lead with a definite goal of the season worthy strike from forward Matt Thorsheim. Midfielder Vincenzo Pugliese sent a ball across the penalty area that took a bounce toward the top left corner of the box, where Thorsheim was positioned. The forward smashed a volley with his right foot that flew into the far corner of the net. Thorsheim said, “I just knew I was gonna hit it from the second it bounced. It bounced perfectly in front of me, and I just couldn’t have connected with it better.” The strike was not something that the forward considers to be a part of his usual skillset. “That was kind of a special one for me,” he laughed. Immediately after the goal, Copa pulled one back due to a mistake by goalkeeper Scott Weigel. After giving the ball away inside of the box, Weigel was helpless as striker Raphael Araujo received a pass across goal from his teammate and tapped it in to make it 2-1. In stoppage time at the end of the first half, FC Monmouth restored their lead back to two goals. Defender Kevin Kappock played a hard pass on the ground to Covello, who shifted the ball onto his right foot and attempted a shot from about 25 yards out that took a deflection off of the defender in front of him and looped over the goalkeeper. FC Monmouth’s strategy in the second half was to protect their two-goal lead while searching for another via counterattacks. Copa defender Angelo Jack was shown a red card by the referee in the 68th minute for an altercation that took place after a foul near the sideline.